Continuing with the high school state championship sites, Indiana should be next. However, I have already covered that track here. Their state meet is held May 31st and June 1st. This is one of the nicest tracks in the country, so it’s nice to see the IHSAA using it. So Iowa would then be next, and again their track has been covered both here and here. Drake Stadium is one the my favorites, and the high school state meet will be held here May 16-18. So finally we are in Kansas. 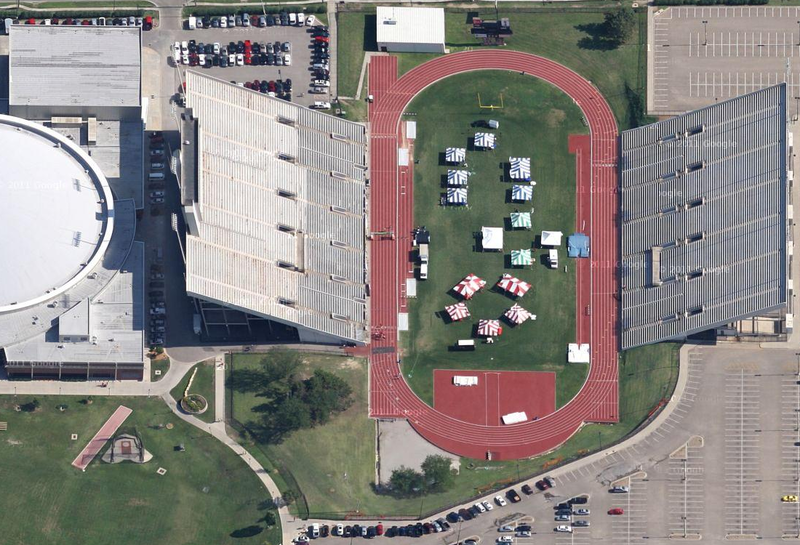 The state championships here are held at the track of the Wichita State University Shockers‘ inside Cessna Stadium. This is a 30,000 seat, track & field-only facility. And yes, that is correct and not a typo – the bleachers hold 30,000 for track. There are six competitive classes in Kansas, and they all contest their state championships here in just two days, so it’s a good thing they do have all this seating. In 2002 the track was re-done, adding an 8th lane, widening the curves, and installing a new surface. All jumps are located on the inside of the track, which makes in nice for spectators. This is an impressive looking stadium, but I’m not sure what the deal is with all the tents on the infield in the photo. May 24th and 25th is when the state meet will be held here.